Bright and early on Monday morning I walked into the hospital for yet another follow up scan. I’ve received more scans than I can possibly count in these nearly four years of fighting this disease. 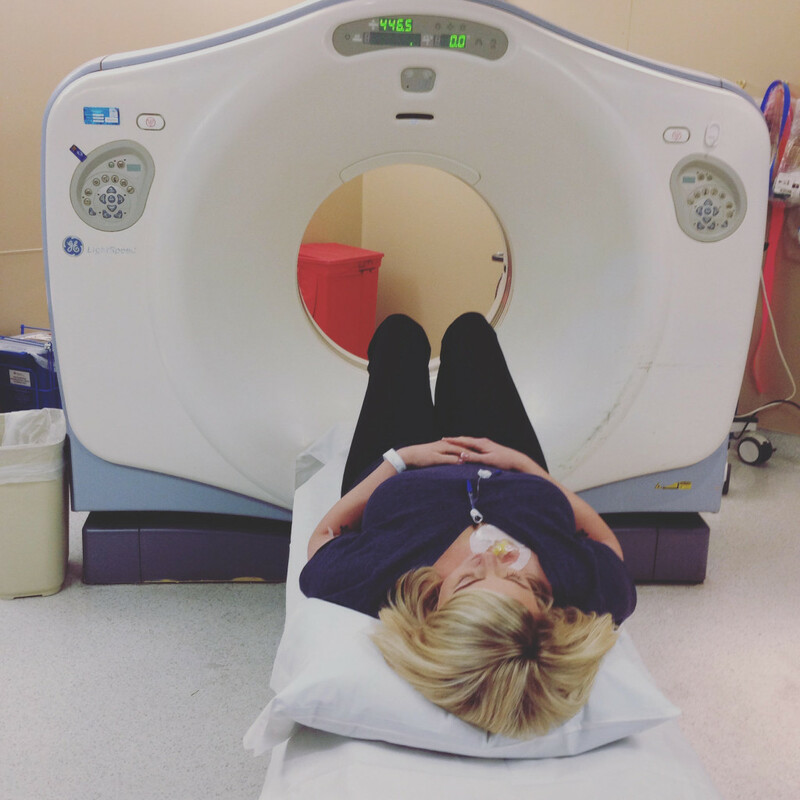 PET scans, CT scans, X-rays, echocardiograms, and ultrasounds. Though my treatment has ended (which brings its own set of relief and fear), I continue to be checked for malignant cells. It’s a double edged sword, really. While I am frequently awarded with reassurance, I’m also being buckled into the roller coaster of anxiety once more. I cannot remember a time without these scans, and I’m not sure if I’m looking forward to the day when they cease to exist any longer. They are my lifeline and my nemesis. These scans never get easier, no matter how frequent and routine they have become. Logically, I should be used to them, yet somehow each time feels like the first. I’m comfortable with the technicians and the machines. I am not claustrophobic nor afraid of needles. I’m not allergic to contrast and know exactly what to expect. However, no matter how comfortable I am with my surroundings, I don’t think I’ll ever be comfortable with the reason I am there in the first place. These scans tell me if cancer has again invaded my body or if it has finally given up and has not claimed residency once more. The remembrance of each recurrence floods my senses and can overwhelm me if I don’t keep a tight guard on my heart and mind. The phrase, “Out of sight, out of mind” rings true, but it’s not an easy practice. Many ask how I feel when scan time comes and to be honest, it’s similar to a rollercoaster ride. Ironically, I used to love rollercoasters before diagnosis, yet now that cancer has entered my world, I have come to loathe them. Blame it on the amount of treatment I’ve had, the fact that I’m menopausal, how I know what true nausea feels like, or that my equilibrium is much different these days… Regardless, it would take a lot for me to willingly jump onto one. Yet, crazy enough, I willingly sit on the rollercoaster of scanxiety every three months. Upon my regular exam with my gynecologic oncologist and the discussion of an upcoming scan, I am standing in line at the ride. I see others walking before me. Hands sweaty, nervous, and smiling artificially. Some have been on this ride so often that they don’t seem to be phased. For others, it’s their first time. The naivety is obvious, and I want to hug them before they hear the news. I know what to expect. I’ve been on this ride many times, but it never gets easier. This rollercoaster can be fun, but it can also be terrifying. When I confirm my appointment time with the staff at the hospital, it’s in that moment when I’m buckled into my seat. The attendant pulls on the chest belt to make sure it’s tight enough. He walks to the next person and does the same. I double check. My seatbelt isn’t tight enough, yet I can’t get one more click tighter no matter how hard I try. Thoughts of me slipping out from the confines of the coaster and slamming hard into the pavement below flash through my mind. I’ve been on this ride before, yet I never know how it’s going to end. Receiving the confirmation call of my appointment time is the beginning of the ride. The coaster slowly clinks up the ramp right before the big drop. Click. Click. Click. The anticipation is equally overwhelming and exciting. I know it will be over soon, but it feels like it’s taking forever. The days leading up to the scan are the twists and turns of the coaster. One twist may be fun, while the turns can be frightening. My hands are gripped to the safety bars and my eyes are closed. Occasionally I open them to see what lies ahead, but it does me no good. My head is jerked from side to side as my feet dangle below me. In one moment I feel safe, and the next I fear for my life. The morning of the scan is the point when the coaster reaches yet another upcoming drop. The momentum slows down while the adrenaline quickly courses through my body. My head lashes forward as the speed slows. I can hear my own heart beat. Again, I am being forced upwards. Click. Click. Click. I know this feeling, but I am never fully prepared for it. I’m praying. I’m looking at the other riders. They offer quick smiles and words of encouragement, “You can do this!” I know I can, but I’m still unsure. Arriving to the appointment is the last drop. I know the ride is almost over, yet my hands are gripped tightly as I know I must free fall without control one last time. I’m excited, scared, and ready. I don’t scream, I try not to cry. I am and always have been a silent sufferer. I tell myself it’s okay. My eyes are closed tight as I begin to fall. The scan is the wind flowing through my hair as I sail down to the end of the ride. My heart begins to calm as I know the ride is over. I begin to release my white-knuckled grip and my breathing becomes more steady. I never want to get on this ride again, though I know I will have to. Out of sight, out of mind. I will stay in this moment and not look too far ahead. Awaiting the results is the walk to the kiosk that displays the picture that was taken as the coaster made its final descent. Will I look stoic and strong or fragile and frightened? This picture will determine my fate. Will I be celebrating or lamenting? As of today, I’m still walking to that kiosk. I have not yet heard the results of my latest scan. I believe it will be good, but there will always be a small portion of me that is prepared for what happens if it’s not. When (not if) this scan shows no evidence of disease, I will have reached 19 months cancer-free. One step closer to the two year mark. One step closer to this being my past. One step closer to the exciting future that is to come. Will you continue to pray for us as we await the results? A variety of exciting developments have been stirring lately! If you follow me on Instagram or Twitter, I’m sure you’ve seen posts about my recent business trips to New York City, Orlando, and Houston. I am touched that my story is impacting and inspiring so many, and in turn that I am able to travel and share a message of hope and faith around the world. We were never meant to walk alone and I am passionate about walking beside others in their struggles. 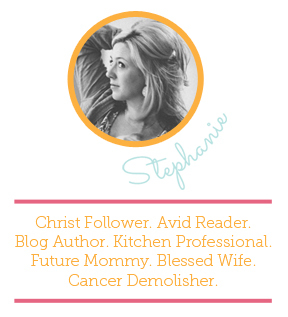 Among several recent ventures, I’m honored to officially announce my partnership with Cancer Knowledge Network. CKN is one of the largest cancer communities in Canada, and their goal is to help bridge the gap between young adult patients and oncologists. Because of the work of CKN and other organizations like Stupid Cancer and Livestrong, the YA (young adult) cancer community is growing in knowledge, understanding, and impact. When a young adult is diagnosed with cancer there is no longer a void of community, as many have rallied together to let the world know that we are not alone. As the spokesperson and partner of the #YARally campaign with CKN, I’ll be writing several articles on a variety of hot topic issues that affect young adults in the cancer community including but not limited to body image, sexuality and relationships, finances, and fertility. Too often, the communication between doctors and patients is muddled and our goal in this project is to facilitate personal narratives combined with clinical resources in order to bridge the gap. We have recently launched our campaign, and I invite you to join this journey with us. Make sure to follow #YARally on Twitter, as well as my Instagram and Facebook pages in order to stay updated as this project develops. In addition, I will be co-leading Twitter chats and would love to talk with many of you on the topics being discussed in this campaign. 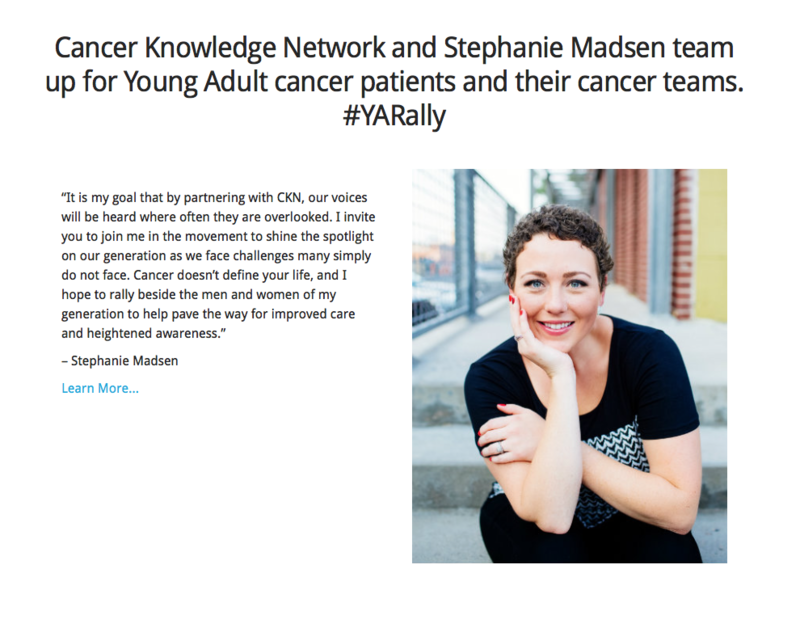 Visit Cancer Knowledge Network’s #YARally with Stephanie Madsen to join the movement! I look forward to opening the conversation and raising further awareness for this critically important young adult community.